Home / Unlabelled / WHO HAS THE RIGHT TO DECIDE THE AMOUNT OF MAHR TO BE GIVEN BY THE HUSBAND TO HIS WIFE? 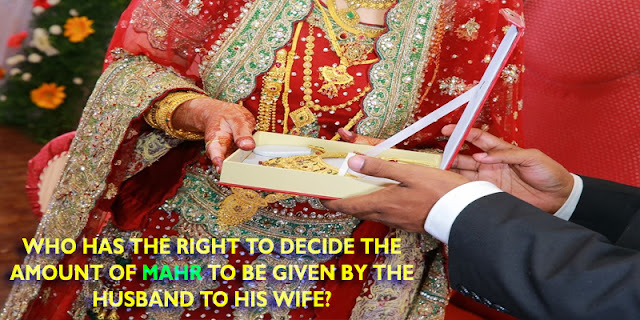 WHO HAS THE RIGHT TO DECIDE THE AMOUNT OF MAHR TO BE GIVEN BY THE HUSBAND TO HIS WIFE? Deciding the amount of the dowry is to be left to the woman and her guardian. If the woman disagrees with her guardian about the amount of the dowry, then what appears to be the case from the words of the scholars is that they should take as a reference the dowry of a woman of similar standing. If she agrees to the dowry of a woman of similar standing, but he wants more than that, then no attention should be paid to his wishes. If he is the one who wants a dowry like that of a woman of similar standing, but she wants less than that, then what matters is his view. With regard to the amount of the dowry, there is no set limit. Rather it is whatever is agreed upon by the couple or by the husband and the woman’s guardian, whether it is small or great, but the Sunnah is to make the mahr smaller and to be easy-going concerning this matter. This is the practice of the Prophet (blessings and peace of Allah be upon him). It is essential to have a mahr in the case of marriage. Once the amount of the dowry has been agreed upon, at that point it becomes a right only for the woman, which the guardian must hand over to her, and not take anything from it except with her consent. After the marriage contract, it is permissible for her to give up to her husband all of the dowry or part of it, on condition that she be of sound mind. If marriage occurs without a dowry, it is still valid, but the woman is still entitled to a mahr like that of a woman of similar standing.